Contest: WIN: Your Very Own EImmie Doll! 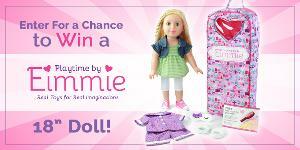 WIN: Your Very Own EImmie Doll! Prize: Eimmie is an 18-inch high quality doll who comes with an adorable outfit, plus pajamas, sleep mask, and slippers. She arrives in her own backpack carrying case, so she is ready to go anywhere. Statistics: This contest was opened by 121 and entered by 13 ContestChest.com members. 11% of those who opened the contest, entered it.